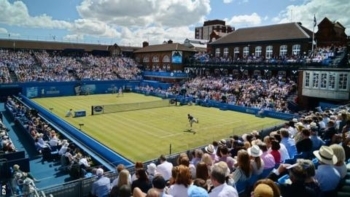 Emirates Skywards is offering tickets for the Queen’s Club tennis tournament in London. This is the traditional mens event which runs immediately before Wimbledon. It runs from Monday 18th June. Standard tickets are priced from 7,500 Skywards miles to 10,500 Skywards miles per person but most had gone when I looked yesterday and there may be little this morning. VIP hospitality packages (for sale for cash by Keith Prowse for £1,200 inc VAT for two) were still available on most weekdays. The mileage cost varies by day. Unfortunately you cannot see availability without having the necessary miles in your account so I wouldn’t risk making a speculative transfer from Amex. If you were moving points, transfers from American Express Membership Rewards to Emirates Skywards are usually instantaneous. Mine was yesterday. However, your accounts must already be linked for this to happen. American Express states that transfers take two days so you don’t have any come-back if they do not instantly appear in your Emirates account (you need log out and log in again) and you miss out. Full details are on the Skywards website here. American Express has added further Lufthansa lounges in Germany to its American Express Global Lounge Collection. From now on Platinum and Centurion Card holders can enjoy complimentary access to selected Lufthansa lounges at Frankfurt Airport. It covers the three Business and Senator lounges in Terminal 1 Concourse B.
Lufthansa lounges in Munich were added in October last year. This is only for the Business and Senator lounges in the Terminal 2 satellite. This deal will run until at least 31st March 2019. More information about the American Express Lounge Collection can be found here. 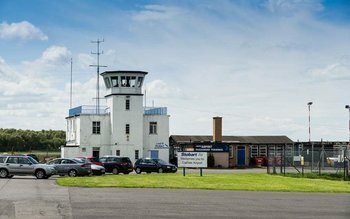 With remarkably little notice, the launch of scheduled air services from Carlisle Lake District Airport, planned for Monday 4th June, has been postponed until 3rd September. The airport blamed this on “the growing global shortage of qualified air traffic control staff available to meet training and regulatory deadlines”. The airport will be able to handle general traffic, as this requires a lower level of ATC cover. Passengers booked on the Loganair routes to or from Carlisle Lake District from Belfast City, Dublin or London Southend will be offered refunds or alternative flights from Manchester or Glasgow. Another Sydney O/T the Vivid lights and music festival that is on for 3 weeks each year at this time is sponsored by Amex. So tonight will be trying the free Amex Lounge at Circular Quay which should be a warm place to see the light shows. Winter has definitely arrived here, just purchased some gloves! Yes, Loganair… Happily selling tickets and screwing up people’s travel plans. I think they have behaved quite unethically selling tickets and cancelling them a month before travel. Not impressive. They offered rebooking for September onwards. Nitwits. Otherwise , if your new flight arrives earlier than two hours after the scheduled time of your original flight, you can claim €125. n the event of a cancelled flight passengers can receive a full refund or choose an alternative flight. If you choose an alternative flight you are also entitled to care and assistance. This usually means food, drink, access to communication and accommodation (if necessary). Didn’t the article suggest the fault lay with the airport and lack of air traffic controllers? To be fair, it’s not an airline’s responsibility to provide ATC services at the airports it serves. Why rant about them and not the amateurs in charge of CAX who could clearly have foreseen this and taken appropriate action earlier? Had a bunch of emirates miles about to expire…great use of them! Thank you for information on compensation for Carlisle flights. My Wife and I fly to USA next week and decided to support that airport to get to Dublin for our connection since it will be our nearest. Late on Tuesday afternoon we got an email saying the airport would not now open until September. Local news reports they only have half the ATCs they need to commence commercial flights. This opening has been planned for years, they must have known there were major problems well before we were told. At short notice we have had to arrange alternative flights from Newcastle at extra cost and had to pay for car parking which would not have applied at Carlisle. When flights do start in the future from Carlisle, we will not be using them, we would rather travel to Newcastle or Manchester after being let down badly so close to flying. I wouldn’t hold a grudge about it for life. Just because you have to drive 45miles to Newcastle. Stuff like this happens. Iv had 4 flights cancelled and I will still be booking again when it’s up and running. I’m from Carlisle and word on the street is the fire crew is also understaffed for the size of the planned operation. It took me about 3 weeks when I applied shortly after the personal card was launched. But that was due to a backlog of 50,000ish applicants in front of me. OT: I’m planning to book a flight from IST to SIN maybe November or January, however I am under the impression that the new airport will be open by then. Presumably if i book my flight now, it will be automatically moved to the new airport when it does open? Not sure how this will work with accomodation though. There’s a long thread on FT (TK forum) about the opening of the new airport. If it is open, I believe you will be automatically moved if your airline has moved too. There are suggestions that there will be a phased move with some airlines moving earlier than others. There are also suggestions the airport won’t be ready on time. O/T – Marriott status query. Have gold through SPG status match which is via amex plat. Have a 2 night stay booked at a Marriott in September, booking was made in March before the announced changes to the Marriott rewards programme. Looks like now won’t get the lounge access and complimentary breakfast I thought I’d get ……… contacted the hotel who won’t confirm what status or benefits I’ll received and told me to contact SPG. If I had know about the changes before booking I’d have booked with Hilton instead. Any advice on where I stand with this? Unfortunately we booked a non refundable rate. I presume that status benefits are not contractual offerings and are always classed as complimentary (even when they say guaranteed). Therefore I think on a contractual basis you have no recourse to cancel the non-refundable booking and receive a full refund because of the status benefit changes. However you may as well call SPG/Marriott and see what they say …. O/T regarding IHG accelerate 6000 bonus weekend stay target. A recent 2 night stay using the ambassador free night certificate did trigger this offer. I report this because a few people reported on here that it would unlikely trigger the offer – no idea if i was lucky or if rules have changed. Isn’t it normally only the ‘book via app’ target that needs to be during the period? Of course my booking has now been altered by the hotel (for an upgrade) so based on previous experience it may not properly show up as an app booking!! Good to know, I must admit I was assuming it would when it came to working out my eligibility for the offers, now slightly apprehensive that it doesn’t for some reason! Ot- need some guidance, booked a 241 rfs tickets for two adults, but need to add an infant baby, 6 months old to the booking? How do I do that online? Also, do you pay for carrying an infant in the lap? If its short haul to lca, do I need to worry re cot/bassinet etc? Give BA a call – infant price is 10% of the miles for an adult. Having an infant on your booking means you can all select seats in advance for free which is nice. LCA’s not so short for short haul, so bassinet might be ideal. OT – just in the Canopy Lounge at Nice airport thanks to PP via Platinum Amex (thanks HFP). The wine selection is shockingly bad (one very generic looking kind of each colour) considering this is France, I’m having to make do with Bombay Sapphire and tonic with my Camembert and crackers – though it actually goes quite well! Return flight from Nice to Manchester delayed again, but the lounge is a pleasant enough place to wait. Last time I was there, they had champagne on request. Wasn’t well advertised, luckily flyertalk had tipped me off. Could be worth asking! OT So my renewal for Amex plat has happened. Just wondering what to do. Keep it, churn it? Got 1 referral left (if its calendar year or is it card year?) so I could take out say the Nectar card, also just holding the SPG card from Amex. Do I keep it for PP and Plaza lounge access, worth say (£159 for PP with 10 visits). Plaza is worth £40 a visit. Well, it’s your call. How much time do you spend in airports? Or at hotels where the status helps significantly? I’ve just canned mine. I’ll take it out again just before the next time I’m planning to be out of the U.K. for leisure. Time in airports of 50/50 in terms of lounge usage. Also Oslo has no lounge where I travel to a fair bit. I’ll get to keep the hotel status, plus is seems the SPG status will be binned anyway come August. Taking out Nectar would give you about 6 months of cost recovered, plus lounge passes and insurance for free. O/T Just been looking at Virgin Atantic flights for a quick trip to the US this summer. I was thinking about a hand-luggage only (Economy Light) fare, but decided against it when it would cost £420 less to go Economy Classic and take hold luggage. Sometimes pricing doesn’t make sense so it’s always best to look at all options! Just ordered some suncream from Ocado where it was 1 for £12 or 2 for £10. Go figure! I bought from one on their list of nearby stations on Saturday evening and didn’t get an e-mail or statement credit showing on account yet. Not for tomorrow but we may get to it later in the week.